Matt R requested a 1972 Banks, and I happened to have that one already done, so he gets back to back requests (Night Owl, check your email for the Boog Powell card, and the Kingman card will take awhile). These cards couldn't have turned out any better in my opinion. Either I'm getting better at this, or 72 Topps is just such a great template. 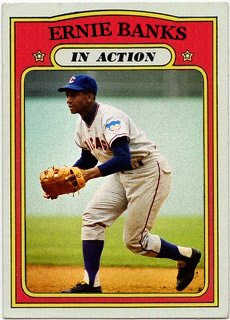 Anyways, 72 Topps was missing Mr. Cub from their product line, and with 787 cards in that set, I find it hard to believe Ernie couldn't make the cut. 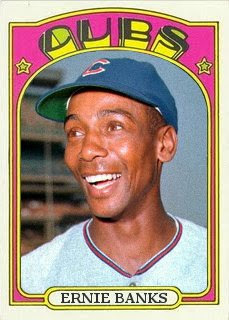 True, Mr. Banks had a very subpar year for his standards, barely scratching any respectable ABs in 1971. I don't know the history, but he must have been injured that season. Version 2 - In Action! Backlogged cards ready to roll include: 90 Schmidt, 88 Jackson (almost), 80 Hunter, 77 F. Robinson, 76 F. Robinson and 75 Kaline.